GFCI (Ground Fault Circuit Interrupter) - United Electrical Contractors, Inc.
A ground fault circuit interrupter, called a GFCI or GFI, is an inexpensive electrical device that can either be installed in your electrical system or built into a power cord to protect you from severe electrical shocks. GFCIs have played a key role in reducing electrocutions. Greater use of GFCIs could further reduce electrocutions and mitigate thousands of electrical burn and shock injuries still occurring in and around the home each year. Ground fault protection is integrated into GFCI receptacles and GFCI circuit breakers for installation into your electrical system, especially for circuit outlets in particularly vulnerable areas such as where electrical equipment is near water. Portable GFCIs are also available to provide on-the-spot ground fault protection even if a GFCI is not installed on the circuit. The GFCI is designed to protect people from severe or fatal electric shocks but because a GFCI detects ground faults, it can also prevent some electrical fires and reduce the severity of other fires by interrupting the flow of electric current. A ground fault is an unintentional electrical path between a power source and a grounded surface. Ground faults most often occur when equipment is damaged or defective, such that live electrical parts are no longer adequately protected from unintended contact. If your body provides a path to the ground for this current, you could be burned, severely shocked or electrocuted. A GFCI constantly monitors current flowing through a circuit. If the current flowing into the circuit differs by a very small amount (as little as 0.006 amperes) from the returning current, the GFCI interrupts power faster than a blink of an eye to prevent a lethal dose of electricity. GFCIs are designed to operate before the electricity can affect your heartbeat. 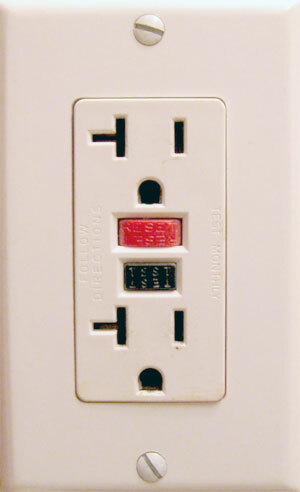 A GFCI works even on two-slot receptacles. shut off before a fatal shock can occur. The circuits that require GFCI protection are designated by the National Electrical Code (NEC). The NEC typically only applies to new construction/major renovations. The coverage of GFCI protection has gradually increased over the years. Circuit breaker and receptacle-type GFCIs may be installed in your home by a qualified electrician. Receptacle-type GFCIs may be installed by consumers with adequate knowledge and skills to conform to proper electrical wiring practices and the instructions accompanying the device. When in doubt about the proper procedure, contact a qualified electrician; do not attempt to install it yourself. A portable GFCI gets plugged into a receptacle just like any other cord-and-plug-connected device.